I found a new home! I've been adopted to a wonderful home! I'm joining the family of the artist of Reflection of Compassion! Oh hey, what are you doing? That looks interesting -- can I help? Don't mind me, I'll just lean on your leg to get a better look. Do you want to know more about me? Well, once upon a time I had a husbun and some kids. Our human decided he couldn't take care of us -- I guess he hadn't heard about spay and neuter -- so he put us outside to live in a junkyard. That was pretty tough. We managed as best we could until some nice people came to take us to a shelter. Some of my kids were pretty shy, but I ran right up to these folks -- I just love meeting new people! They took us all to the shelter, where someone wanted to adopt my husbun, so they let him go without me. I was pretty sad about that, but at least I wasn't outside anymore and there were nice people to pet me and talk to me every day. When I lived with a foster mom and dad (I'm at SaveABunny now), and I just loved the house rabbit lifestyle! My foster parents always laughed with me as I follow them around to keep an eye on things. I like to honk as I hop, and I have to admit it's pretty cute. I surprised my foster parents with how neat and tidy I was, even before I was spayed. What can I say -- it's nice to be clean. I like to toss toys and forage for hidden treats. I absolutely love to snuggle, and my foster mom was surprised that I even love to snuggle in her lap. I think it might be nice to snuggle with a husbun again, as long as he can accept that I'm the one in charge! As you can see, I'm a lop, but I have the secret superpower of being able to lift my left ear up to hear you better. Do I have any other superpowers? You'll have to adopt me to find out! Reese is pleased to introduce herself to the world. 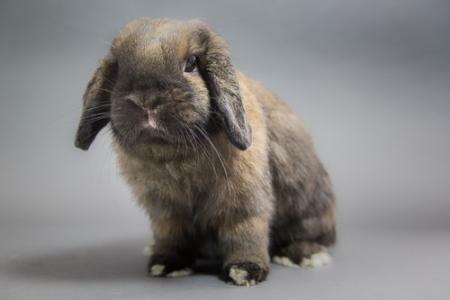 She's the third and last brown lop who arrived at SaveABunny over the weekend (along with boys Mayfield and Fitz Roy). Had a little whoopsie while exploring a tunnel! Watch what happens when Reese tries to stand up in her tunnel about 30 seconds in. Reese is in foster with Erin Casteel but is available for adoption. Meet her: http://saveabunny.org/rabbit/reese.